If you haven’t checked out our face book page in a while I posted a pic of a recipe that we experimented with here at the farm. First you wash the swiss chard and cut the stems from the leaves, saving the stems for the filling. Cook 2 cups of rice with 3 cups of water 1/2 cup of vinegar, 1 T oil, 1/4 cup of sugar and 1 T of salt. Place damp swiss chard leaves in the microwave for 1-2 minutes or until slightly wilted. Slice the stems of the chard into thin strips. You may add carrots, zucchini, cucumbers or any other crisp veggie or fruit, also sliced into thin strips. Lay the chard leaves flat and spoon the rice mixture into the center of the leaf. Lay the strips of the stems parallel with other veggies of your choice. 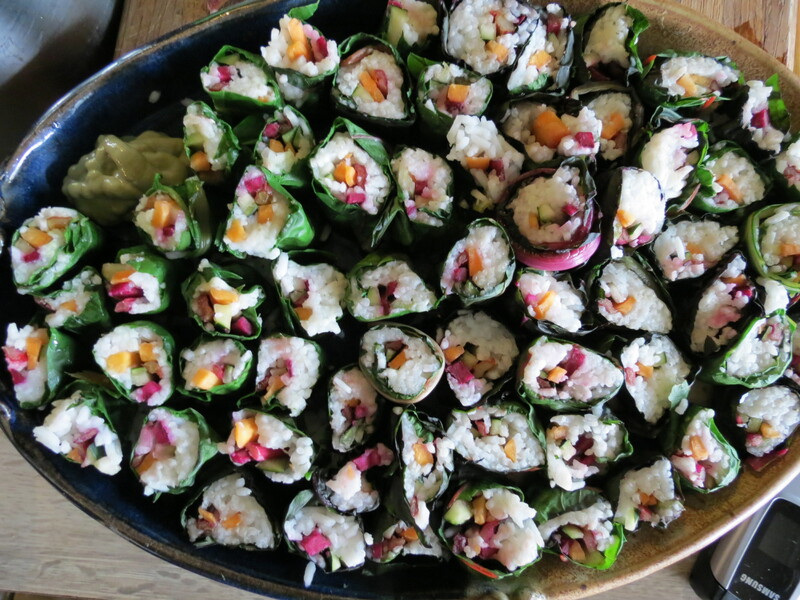 Roll the leaf around the rice and stems and slice. Week 10 Eggplant, Parsnips and Peppers! Such a refreshing idea and what pretty colours! I’m very keen to try this and thankfully have a good amount of swiss chard in my garden.